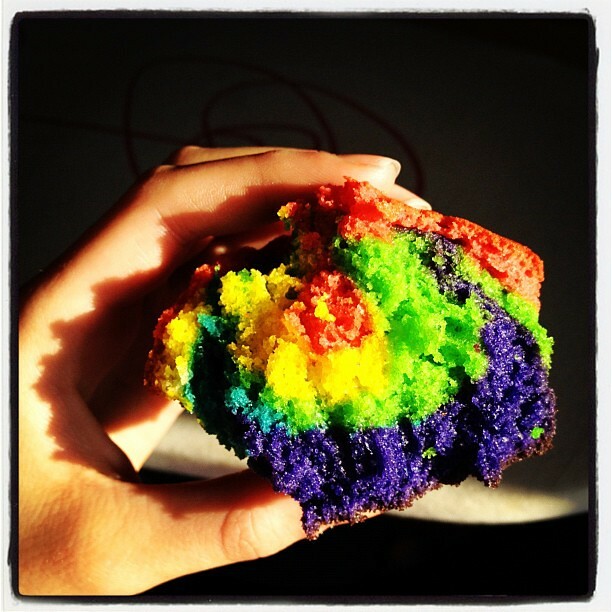 if you've been on pinterest at all in recent months, you know that rainbow cakes and cupcakes are all the rage. since it's sabin's 11th birthday tomorrow, i just had to jump on the rainbow bandwagon. 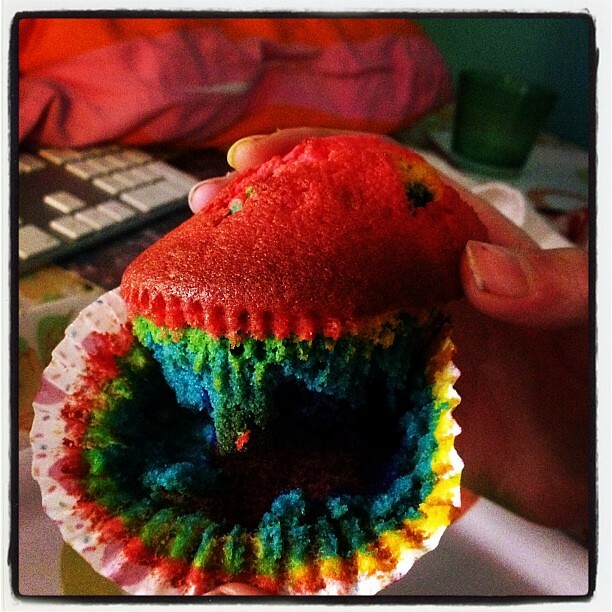 today, we baked rainbow cupcakes to share with her class (thank goodness in denmark, it's still ok and even encouraged to bring homemade treats to school) and with our friends at the riding club. sabin's best riding buddy actually shares the same birthday, so it's even better! i had been dutifully pinning rainbow cakes for some time, but was a little shocked to find that most of them called for a box cake (oh the horror!). i guess that would make it slightly easier, but honestly, when a scratch cake is as easy as it is, why on earth settle for box? cream the butter in your mixer, then add the sugar and further cream until it's smooth and light yellow. add your eggs, one at a time and then the vanilla. then add flour (+ baking powder and salt) and milk, alternating until they're well mixed. separate into 5 smaller bowls to make red, yellow, green, blue and purple - i actually used two full batches for this, to have a good amount of each color and because i was making a lot of cupcakes. because i was making 60 cupcakes in total, i actually made four batches of the above recipe in total - but my cupcakes are pretty tall, so you could get more out of this recipe by putting less of each color in each cupcake. but i started with combining two batches to get started. 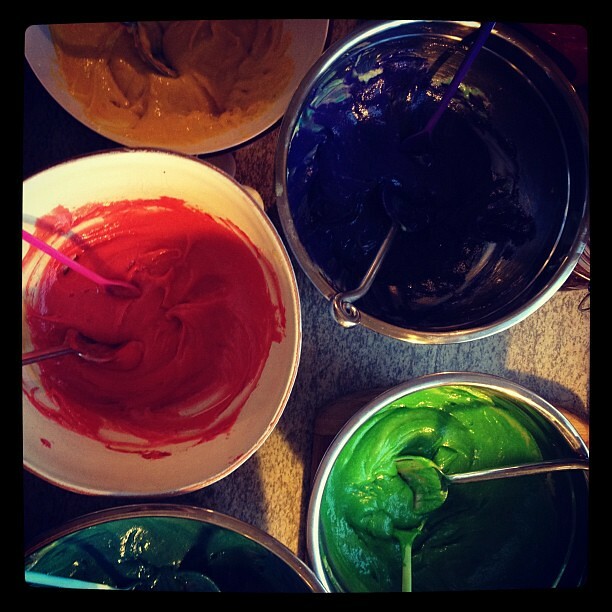 then, as we worked and realized it wouldn't be enough, we made another batch of batter and added to our existing colors - twice. 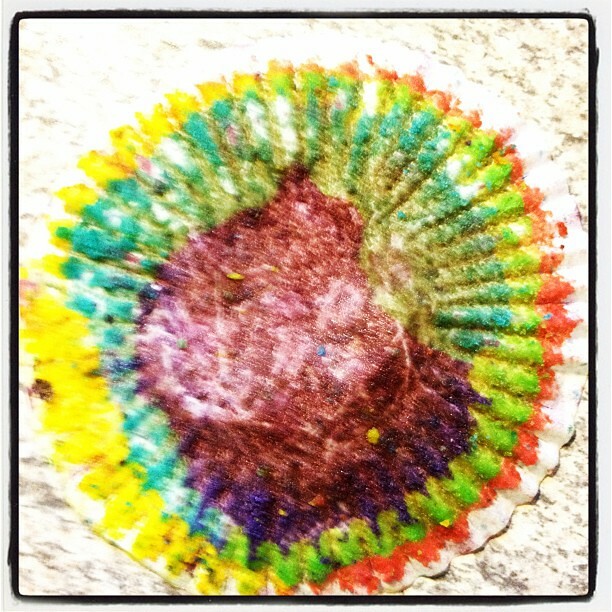 once you've got five colors - put a spoonful of each into your cupcake papers. i started with purple on the bottom, tho' we experimented and tried it on top once, but it goes awfully dark and doesn't show how prettily purple it really is if it's exposed to the heat on top. my color order was purple, blue, green, yellow, pink. 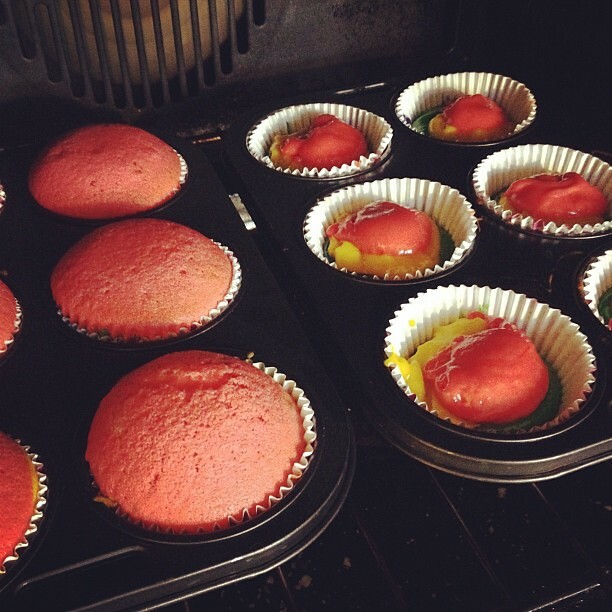 we also tried with yellow on top, but then they look a bit like an ordinary cupcake. bake them 10-12 minutes at 180°C/350°F. 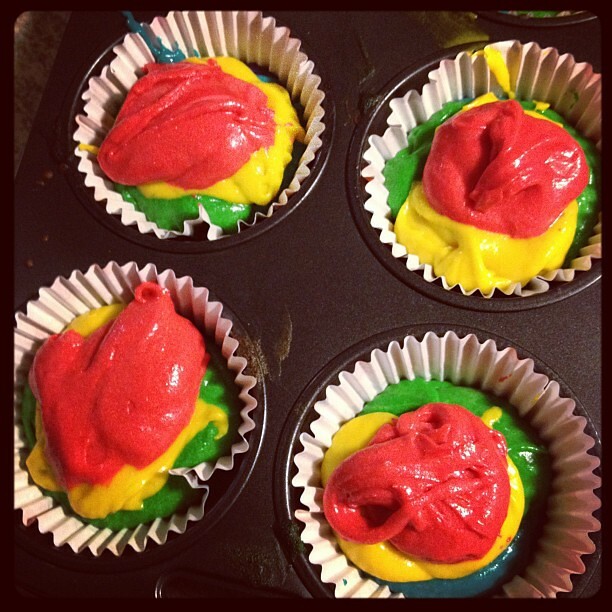 see how in the heat of the oven, the colors even out? tho' you can make them as messy as you like, it's really up to you. i really think you can't go wrong with this recipe.